Peay Vineyards is located in the far northwestern corner of Sonoma County approximately 4 miles from the Pacific Ocean near Sea Ranch. The vineyard is situated along the coast, but not on the very first ridge. We have a partially obstructed avenue formed by the Wheatfield Fork of the Gualala River that allows for some fog and copious cool air penetration. 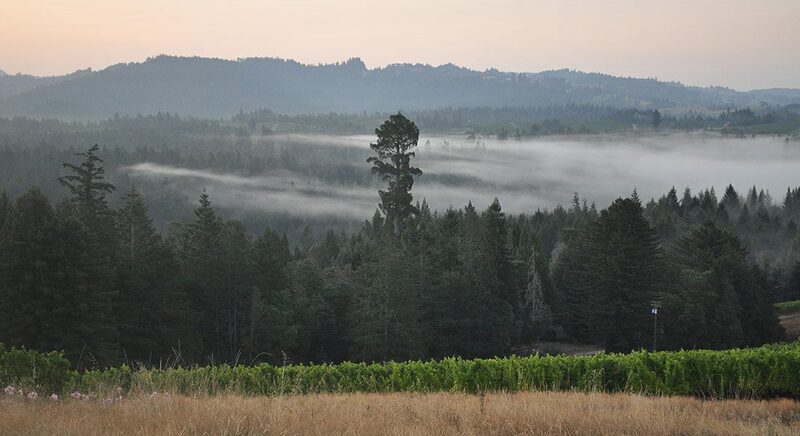 The vineyard sits on a hilltop that is not way up in the air, but just at the top of the fog level, low enough to be very cool, but high enough not to be too cool and wet to grow grapes. We think it is the perfect combination of climatological factors. California has a diverse range of microclimates. Our hilltop vineyard also expresses many subtle variations depending on whether it faces south, southeast or west; sits high on the hilltop in the afternoon breeze with full sun; or rests lower on the slope with greater fog influence and less sunlight. But make no mistake, this is pretty cool climate for grape growing. We cross our fingers hoping that the fruit will ripen before rains start in late October/early November. In some years, getting it ripe has been a challenge. But that is why we produce superior fruit. Due to the cool climate we have a long growing season with moderate temperatures ideal for maximizing the production of intense flavors and phenolic compounds that result in complex wines. And we will always have plenty of acid to provide structure. No flabby, overripe wines here. While the beautiful symmetry of our planet may suggest even gradations of climate as you move from the equator to the poles, in reality, there are a multitude of phenomena that belie the tidiness of such an understanding of the Earth’s climates. The first major factor is the Coriolis Effect, or the force created by the earth’s rotation, that causes the circulation of the world’s oceans. Easterners recognize the result of this effect as the Gulf Stream. A warm current flows north out of the tropics along the coast to the Grand Banks off Labrador. On the West Coast, we have a cold, southward flowing current that runs along the coast of the Pacific Northwest and northern California. Weather flow pattern is from west to east across North America, from the warmer waters at the center of the Pacific Ocean towards the California coast where it hits the cold ocean current along the California coast. The air cools forming a coastal strip of cool climate. As the air travels across the land mass, the temperature of the land changes the temperature of the air – warming it in summer and cooling it in winter. As a result, the immediate coast of California does not experience the extreme temperature variations as do parts of California further inland. From a satellite’s perspective, the West Coast of the lower forty eight would represent, if it were temperature coded, a long narrow strip running along the ocean’s edge, likely colored blue to denote cool. In actuality, it’s an inverted triangle with the fat end up by Portland, Oregon and the skinny tip down by Lompoc in Santa Barbara County. If you are inclined to check out the weather page of your local newspaper, you will likely observe the bands of forecast high temperatures revealing that sliver of coolness, something that is apparently overlooked by the shivering short and t-shirt clad tourists in San Francisco. Now, let’s consider the weather from a cross-sectional perspective. Out in the middle of the Pacific, the temperature of the air in contact with and just above the ocean is controlled by the temperature of the water. The moisture content of the air is relatively saturated, being in contact with a body of water. Near the coast, the air temperature drops along with the temperature of the water (due to cool coastal current, see above). Since cold air has a lower water holding capacity than warm air, some of the dissolved water in the saturated air changes from gas to liquid in the form of tiny droplets that we observe as fog. If you were to inspect this cross section of air near the coast the bottom layer would be cold and foggy, but the upper layers would gradually increase in temperature. This gradation is surprisingly well-maintained, free from mixing or churn, because cold air is heavier than warm air. In interior valleys, this phenomenon is reversed. Inland the summer earth radiates heat warming the bottom layers that remain hot since there is very little air flow or circulation from the coast. As you go into the upper layers of the air mass, temperatures are cooler as experience has shown from backpacking trips you might have taken in the mountains. This accounts for why, in summer, you find cooler temperatures in the mountains of Napa as opposed to the valley, yet cooler temperatures in the river valley of the Russian River, near Guerneville say, as opposed to the surrounding hills.